This documentation is dedicated to the renewed dhtmlxVault of version 3.0. To get information about the previous version 2.5, follow the related documentation. dhtmlxVault is based on dhtmlxLayout that consists of a toolbar which can contain up to three default buttons, a progress bar and a file area. It presents a container that gives the user a choice among several options for adding files for upload. The user can use the "+" icon in the upper left corner, or the Browse files button to open the dialog window where files can be selected. Another way is to open the File Explorer on a computer and drag necessary files from it right into the Vault. By default files are sent to server automatically as soon as a user drags them to Vault. 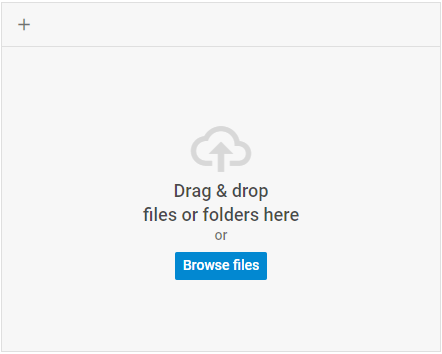 You can disable autosend and use the Upload button that appears on the toolbar for uploading files added to the queue. When hovering a toolbar element, a tooltip with a hint appears. Tooltips are based on the dhtmlxTooltip component and can be configured via its API. 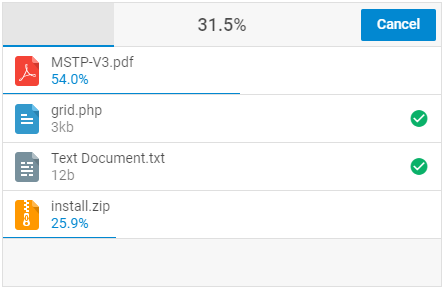 The progress bar shows the total progress of uploading to server in percent. It is located in the same layout cell where the toolbar is placed. During uploading the toolbar is overlaid by the progress bar that contains only the Cancel button to cancel files uploading. Each uploaded file also gets an individual progress bar to show the progress of its uploading. The progress bar is not rendered when the toolbar is switched off. 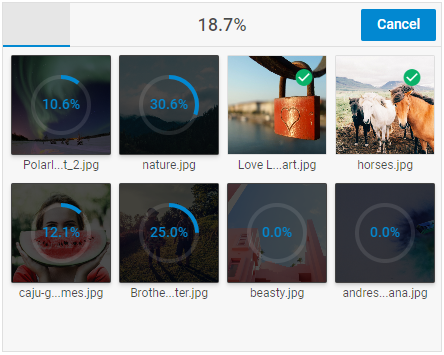 In this case files are uploaded automatically and the progress of uploading can be tracked by individual progress bars of files. dhtmlxVault has a very flexible structure, which includes a customizable layout and an adjustable toolbar. 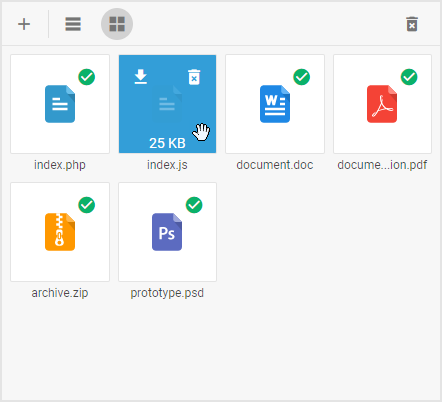 The list of files added into Vault for upload can be rendered in two modes: as a list (default) or as a grid to display previews for images. 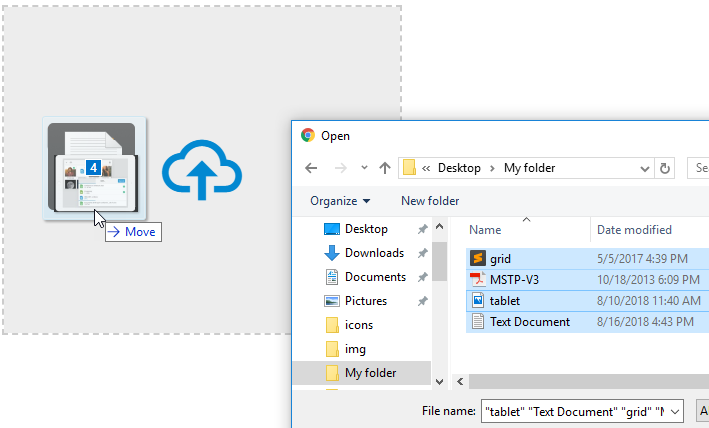 In the grid mode hovering over a file preview with a mouse pointer shows the size of the file. It's high time to add dhtmlxVault into your application to equip it with a prompt file uploader. Follow the directions of the How to Start tutorial for guidance.